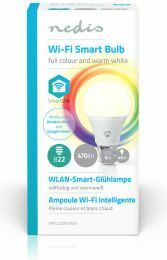 Take control of your lights with this Smart Bulb that connects directly to your wireless/Wi-Fi router to offer remote control as part of your home automation system. Easy to set up You don’t need to be a technical genius or an electrician to control and automate your lighting remotely. 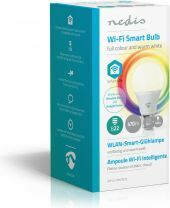 All you actually need is your Wi-Fi router, our intuitive app and these Nedis® Wireless Smart Bulbs. No extra kit and no connecting hubs: this is home automation made simple. Control the bulb’s brightness and colour Connect them up and you can now control the brightness and the colour of these bulbs from your smartphone or tablet. And if you’re getting super smart you can even control them with your voice via Amazon Alexa or Google Home. 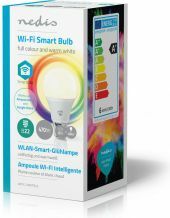 Set up schedules and pair with other smart products Set up time schedules for the bulb to be switched on or create ambient scenes in an instant by pairing this bulb to other products from the Nedis®SmartLife range. Eco-friendly Your home not only gets smarter, it also gets eco-friendlier. These energy-efficient bulbs have a maximum power consumption of 6 W but they give you an output of around 470 lumen, which is the same as most 40 W bulbs offer. About Nedis®SmartLife Discover a wide and ever-expanding range of products - such as bulbs, switches, sockets, sensors, and cameras – that can all be controlled through an easy-to-use and intuitive app. With voice control features supported by Amazon Alexa and Google Home, and no need for anything more than your existing Wi-Fi network, this is the connected, smart home made simple. Whether you're looking for a single smart bulb or socket, or you want to automate your entire house, discover how accessible smart technology is today.